The amazing up rise of the mobile technology has been the most defining thing that has changed the entire way how business is done in the new age digital world. In addition to this, the way in which the devices interact with each other has been changed to an unforeseen level and a major shift is done to the culture of the companies. Digitization and the inclusion of the new age technologies have been the main reason for the noteworthy change as everything is done on the smart devices and stored digitally on the cloud. Augmented Reality and Virtual Reality are often tipped as a “Cornerstones of Technology” and the recent inroads that it made in the world of technology has been prolific to watch. The success of PokemonGo and usage of virtual reality in various fields is a prime example of the importance of both these technologies in the present time. The digital world is all about information being stored and data is thoroughly analyzed and circulated before future advancements. And the amalgamation of augmented and virtual reality that is “Mixed Reality” will be highly instrumental is capable of bringing unimaginable experience to the users at all levels. The digital devices will be highly synchronized and will transmit seamless functionalities. As the name itself suggests, MR (Mixed Reality) is a perfect blend and amalgamation of Augmented Reality and Virtual reality. It takes the best from when merged together and can integrate into different technologies that include advanced optics, computing power and much more. As we know that AR technology creates a whole new world that embodies the virtual characters into real life and VR tech creates a new scenario that engulfs the user. Thus with Mixed Reality, there will be a top notch series of occurrence for the users. It is a fuel for platforms, devices and software ecosystems with the ultimate goals of uplifting the paradigms of communications and collaboration. Let us see the different industries in which MR has been the fulcrum of digital transformation. Mixed reality can be a boon for the on field technicians and workers as it will help them align all the applications into one, in a well-synchronized manner. We all are aware of the fact that “Technology on the go” is majorly necessary for the on field technicians to be on their mark with their work. Mixed Reality will be the perfect platform for them as it will connect with the people in charge to get on time instructions according to the work assigned. Underlining the fact that MR is easier to use, it will foster the field operations in a synchronized and timely manner. For companies to prosper on a greater extent, it is necessary for them to have a subtle and free flowing communication system. Mixed Reality can support the multidisciplinary teams, either in the house or on site by productivity tools and video conferencing related to a specific task. The digital marketers here can collaborate in real time with their customers or clients and can pitch the sales presentation in a fruitful manner. An organization can also visualize their methods and improve upon it so as to stay afloat in the ever-changing tech scenario. Primarily, the automotive manufacturers are applying these methods to view and improve their designing methods so as to accelerate the development process. High tech marketing is the need of the hour and amalgamating MR technology in the marketing scheme of things will give the digital marketers a chance to rectify their process as and when needed. Leveraging the proper benefits of Augmented Reality and Virtual Reality, companies can provide unprecedented customer services so as to improve the customer engagement like never before. For example, the users can try the product on hand before buying it so that he/ she knows what are the noticeable things that would be a cause of thing for the future. It will help the marketers to keep a track of the buying habits of the customers by gauging their responses and also offer the required product as per their previous buying history. Things like push notifications and content based marketing can get a severe makeover with the help of Mixed reality. Mixed Reality thus ensures a profound digital revolution and the technology is disruptive and versatile in nature. It will shift all the pre-defined paradigms and also bring in prosperity to the real world. Mobile app development companies can take full advantage of this impedes digital revolution so as to outrun their competitors and bring more dependency and solidity to their marketing strategy and products. MR technology will be a game changer for industries such as education, travel, social media, mobile app enterprise and much more. 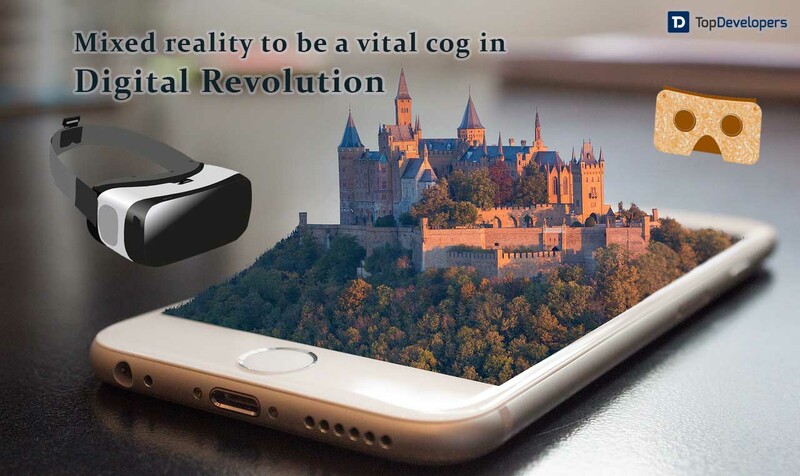 Mixed reality being a fine and apt blend of augmented reality and virtual reality provides the needed impetus to signify the digital revolution. It is proactive and provides endless opportunities to the less traveled and unexplored horizons. As MR will take over, the traditional ways will slowly diminish and the imaginary powers will conquer the business world.